Challenge: Due to rebel rouser poor behavior, the annual parade shut down for two years with plans to resurrect a return to a safe family friendly celebration of Irish American Heritage. The bad apples, created negative connotations and accompanying publicity wiping out two years of a successful family oriented event within the community and the city of Chicago. Some city officials, community leaders and residents were skeptical that the Parade could return to his core roots of a family-friendly, safe fun filled event that celebrates Irish heritage. The Committee was dedicated to bring the Parade back to its roots and worked hard to ensure multiple steps were in place to ensure a positive outcome. We worked closely with the Committee co-chairs, City and community leaders to support the efforts. We developed strong central messages announcing the parade as a family friendly celebration with a zero-tolerance policy for alcohol use along the parade route. We made sure the message was used consistently and frequently by core Parade spokespersons and committee members strengthening the position and spreading the word throughout the community, the city of Chicago and surrounding suburbs and regional areas. We positioned parade committee spokespersons to speak with local print and online media and radio and television news. 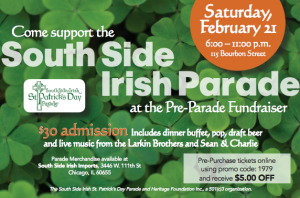 We created ongoing positive events to keep the South Side Irish Parade message in the news in the months leading up and after the parade including stories on holiday merchandise sale, South Side Irish Parade Queen, and developed a timely media preview event announcing Parade Grand Marshal to support a pre-parade fundraising event. We developed positive stories that included key messaging regarding expected parade-goer behavior and zero-tolerance policy for open alcohol along and around the parade route. We also managed on-site media relations facilitating media coverage of the parade itself ensuring all reporters had the message and ability to speak with key spokespersons as well as capture live coverage of the march down Western Avenue. We also worked closely with the Parade’s social media team sharing a robust flow of positive earned media placement stories that were pushed out through social media channels continuing to engage community with core messages and positive behavior. The collaboration reinforced the positive, family friendly message reaching the broad audience through various communication tactics. We successfully reached out to community leaders and residents garnering their support of the Parade’s return through a steady flow of quality earned media placements that helped set the new tone and expectations. We secured over 100 earned media placements during the 2015 parade to support the messages and goals of creating a safe, family friendly environment. 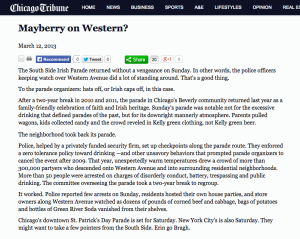 A highlight included the Chicago Tribune editorial “Mayberry On Western” congratulating the South Side Irish Parade Committee and community for embracing the changes and returning the beloved event to its family friendly roots.